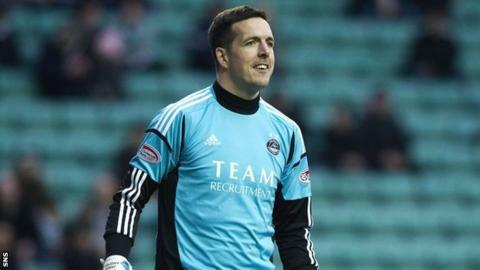 Aberdeen goalkeeper Jamie Langfield is urging the club's fans and players to make a push for a strong finish to the Scottish Premier League campaign. The Dons have slipped to eighth, with one league win in 2013, but have kept in touch with the teams above them. Langfield said on the club's website: "It is such a tight league and we are only four points off second. "Everyone keeps going on about how bad a season we have had but a couple of wins could change things dramatically." A win for the Dons over Ross County at Pittodrie on Tuesday evening would propel Craig Brown's side on to the same number of points - 40 - as Motherwell and St Johnstone, in third and fourth place respectively, though those two sides would have games in hand. County are in fifth spot in the table, a point above their hosts, and can join second-place Inverness on 41 points if they can leave Pittodrie with a win. "With the SPL as tight as it is, the game is massive," said Langfield of the match against the Staggies. "We have three crucial home games coming up and we need to start turning the draws we have been getting at home into wins. "It will be a very difficult game against a side that come here on the back of a fantastic result at the weekend against Motherwell. "We know they are a difficult team to play against. They also have some very good footballers in the side who sometimes don't get the credit they deserve. "Ivan Sproule is on form at the moment but all their midfielders are dangerous breaking forward." Aberdeen, who are out of the Scottish Cup, are looking to avoid a fourth consecutive season in the bottom six.